Recognition has been given to individuals and teams involved in education, health, social care, employment, community projects and volunteering. Campaigning journalist Laura James has received the award for 'Outstanding Achievement by an Individual on the Autism Spectrum' at the National Autistic Society’s Autism Professionals Awards. James was recognised for her media work and novel 'Odd Girl Out'. The Lifetime Achievement Award went to philanthropist Dame Stephanie Shirley in recognition of her commitment to improving the lives of autistic people through her foundation. Hosts Jane Asher and Kate Fox handed out 15 awards to individuals and teams involved in education, health, social care, employment, community projects and volunteering. The winners were chosen by an independent panel of 10 autism experts who judged each nomination on their innovation, creativity, impact and sustainability. 'Inspirational Volunteer' was given to Mandy Garford in recognition of the work she does supporting autistic people and families in Kent, in part as chair of the Dartford and Gravesham Branch of the National Autistic Society. The education accolades went to Ashley High School in Cheshire, the University of Lincoln’s Student Wellbeing Team, Gloucestershire County Council’s IMPACT service and Adele Beeson who works as a specialist skills tutor for Spectrum First Ltd.
HM Prison &Young Offenders' Institution Parc was recognised as Outstanding Adult Service for their work improving support for autistic prisoners and EmployAbility at Cadent received the Most Supportive Employer Award. 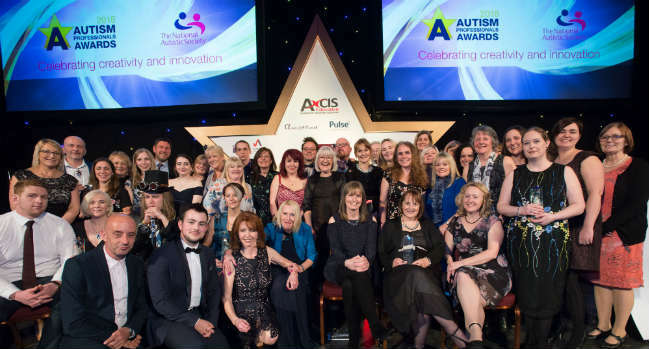 Carol Povey, Director of the National Autistic Society's Centre for Autism, said: "Huge congratulations to all our winners and finalists. They should all be very proud for standing out among so many high quality nominations. "It's been fantastic hearing about their innovative work and the impact it's having autistic people and their families." "We know that support and services in the UK are still far too patchy. We hope that sharing the stories of our winners and finalists will inspire other people and organisations - and give them some ideas about how they can make a real difference."